Good morning all! It's been a pretty busy week here and I have another cute punch art idea for you! The Let's Face it Friday ladies needed to come up with an idea centered around X's & O's. 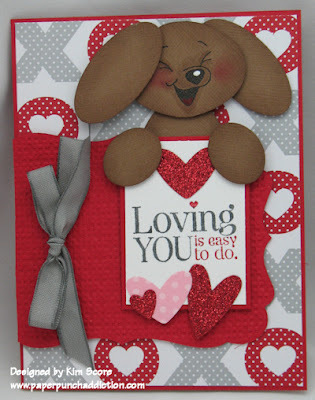 So, of course I got to use my Love Impressions designer paper from Stampin' Up!. Peachy Keen came out with the new Valentine/St Pattys stamp release yesterday and Kathy outdid herself again! My NEW favorite face set was in the batch. It's called Wide Eyed and Bushy Tailed (check it out HERE). I used the 1 1/8" size set for the puppy face. Be sure to visit the challenge site HERE and check out the other great projects. Play along in the challenge for a chance to win a new Cricut Cartridge! The puppy was created using the Ornament punch for the head, Large Oval for the ears, Medium Oval for the paws and Wide Oval for the body. I used close to cocoa textured cardstock. Clip top off ornament and round out bottom. Sponge edges of all cocoa pieces with chocolate chip ink. Stamp PKS face with black staz on. Add white highlight to nose with unibal gel pen. Apply rose ink to cheeks with stipple brush. Color tongue with cherry cobbler marker, inside of mouth with zig pen and add some depth around the mouth and eyes with a blender pen and cocoa ink. Attach ears with dimensionals. Attach head to body with dimensional. Attach paws to sign with dimensionals. The greeting is from the Stampin' Up! Seasonal Sentiments stamp set. I wish you could see this card in person! I also used the Stampin' Up! red glitter paper and it's so gorgeous! I've used a lot of glitter papers in my crafting lifetime but I have NEVER worked with paper this awesome! Love the pup. What a cute card. Thanks. Talk about ADORABLE! I love your sweet puppy! I have several punches and your site gives me so many uses for them - really appreciate it. Haven't used them much until now. Thank you from the bottom of my heart. Kim your card is such a darling! Another great inspiration coming from you. The face on your pup is too cute. I love it. The entire card is awesome. Thanks for sharing. So cute... adorabe puppy! tfS! Love your work. your puppy is so animated. Some bunny thinks your card is super sweet! Thanks for sharing. My goal for the day is to get crafty and join the challenge fun. he is adorable. I had not been to the stamp site before and now have a 'wish list" for sure. What a great idea they have for the stamps.. Bring the punch "critters" all to life. keep it up. so so so creative, adorable card. Love your cards. Your ideas are refreshing and wonderful. OMGosh! This is just soooo cute! I love the little face on the guy!